Are you ready to join over 500,000 people this year who are choosing dental implants to replace their missing teeth? That is great! You’re making a long-term investment in your quality of life and your oral health. Before you get started, you’re concerned about their cost. When determining how much you can expect to pay, there are several factors that influence the amount. Each phase of your treatment features separate fees based on your exact needs. The first step to completing your smile involves a consultation with your dentist. You’ll need to pay their fees for the appointment, but your dental insurance may cover a portion of the cost. The rates of their services are determined by their qualifications, experience, and location. Your dentist will need X-rays and CT scans to assess your jawbone’s health and density. Not only does this determine your candidacy for the procedure but also the location for your posts. The average cost for the scans is about $200- $400, which are often covered under your insurance. Depending on your policy, the reimbursement can range from $275 to $310 per scan. Bone grafting with lab created synthetic bone $250 – $1,100. Self-sourced bone graft $2,000 – $3,000. Non-surgical tooth extraction about $500. Surgical extraction with anesthesia $650. Your insurance may cover some of these costs. It’s best to get a pre-approval from your company prior to scheduling your procedure. Sedation is used to ensure your comfort during the placement of your posts. On average, IV sedation costs around $562. Your insurance may pay for it; however, most policies only cover $1,000 to $1,500 of treatment costs per year. If you don’t have an annual coverage cap, 10% to 60% of the cost may be covered. The amount of your implant placement is determined by several factors, such as how many posts are needed, and the number of teeth being replaced. On average, each standard post costs $1,600 to $2,000. Mini implants are $1,800 to $2,500 each. 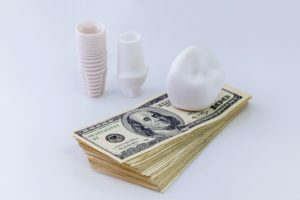 While they can be more expensive, they don’t require abutments, which can lower the amount of the procedure overall. Single Unit Crown: $1,000 – $3,000. Implant-Retained Dentures: $7,000+ both arches or $3,500+ for a single arch. Based on your specific insurance policy, your coverage may pay for 20% to 80% of the restoration fees if you haven’t exceeded your annual allowance. Don’t let the cost of dental implants prevent you from completing your smile. There are several payment options available to make the procedure affordable. Dentistry at Windermere provides patients with tailored solutions to reach optimal oral health. We offer advanced services, like dental implants, to help you achieve a healthy, beautiful smile. If you’re interested in replacing your missing teeth, contact our office today to schedule a consultation.